People use sidewalks every day to get to school, work, and visit a city. Curb cuts allow people with mobility disabilities to safely get on and off these sidewalks. They also help people navigate the city when they’re using bikes, strollers, luggage and other items that roll on wheels. However, many cities and towns have sidewalks that have bad or missing curb cuts. The lack of accessible curb cuts excludes people with mobility disabilities from accessing the services and programs of a city and violates their basic civil rights. 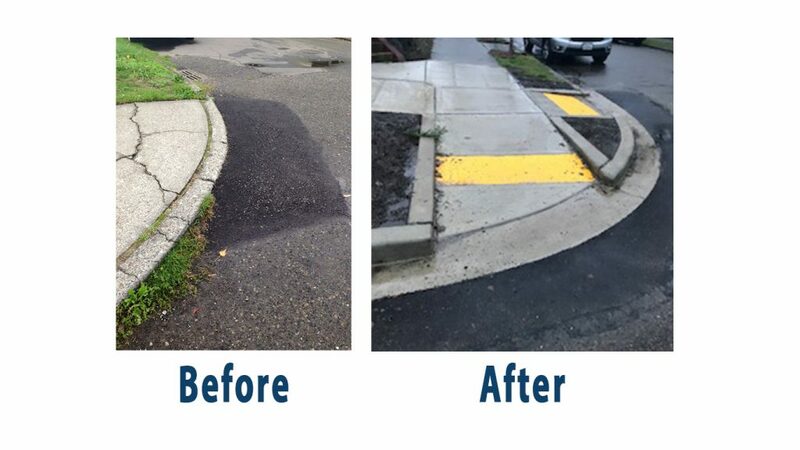 The Americans with Disabilities Act (ADA) requires cities and towns to install and repair curb cuts. Cities and towns have had 25 years to make sure sidewalks are safe and accessible place for all people – including those with mobility disabilities. It’s time we demand that deliver on this promise of equality. In 2015, Disability Rights Washington, filed a lawsuit Reynoldson et al v. City of Seattle, No. 2:15-cv-01608, in federal court seeking the court’s help in ensuring that the City of Seattle makes its streets safe and accessible for people with mobility disabilities. To request a copy of the Proposed Consent Decree in Spanish / Español, Chinese / 中文, or Vietnamese / Tiếng Việt, please send an email to curbramps@creeclaw.org. Please put the language you’re requesting in the body of the email. Show us your #CrappyCurb video that explains the importance of curb cuts. All are welcome to post a photo or video of a #CrappyCurb on Twitter, Instagram and the Rooted in Rights Facebook page. Don’t forget to use the hashtag #CrappyCurb and to share your location in the photo or video!